Millions of students worldwide use PhotoMath to make their learning progress faster and more fun. Use it to get help when you're stuck with a math problem. Hit the steps button, and see a fully explained step-by-step solution! Check below to see the full list of supported Math problems. Students can use it as a tool to learn math, while parents can use it to quickly check their kids homework. With PhotoMath, you can have a math teacher in your pocket! PhotoMath currently supports arithmetic, fractions, decimal numbers, linear equations, equation systems and several functions like logarithms. 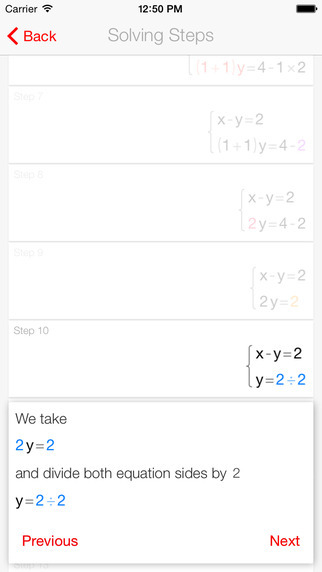 Support for new math is constantly added in new releases as we aim to make the entire math easy to learn and fun. 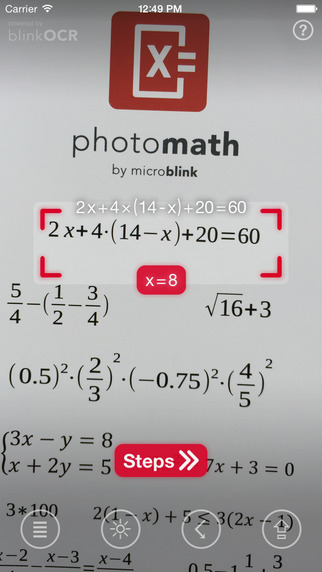 PhotoMath is not fully magical (yet) and it is possible to find a math problem our app will not recognize. If this happens, please send us feedback. With your help, our team of wizards will add new spells to PhotoMath and make it even more magical in the future. More Apps by PhotoPay Ltd. Requirements: Requires iOS 7.0 or later. Compatible with iPhone, iPad, and iPod touch. This app is optimized for iPhone 5 and iPhone 6.